I have lived in Alabang for the last 25 years, and I absolutely love it here. It may be a lot more “chill” here than in Makati or QC, but that’s what I like about the south. 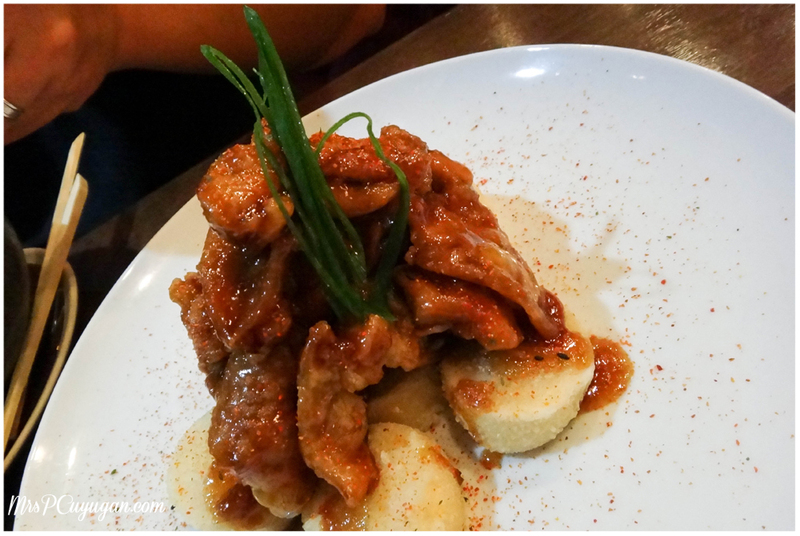 So anyway, over the last few weeks, as I’ve been blog-hopping, I’ve noticed a lot of great restaurants that people have been writing about, and of course most of them are in (you guessed it) QC and Makati. There are a few establishments from those blogs that I’ve already marked as places to visit when I head up north. But apart from giving me new places to discover, those posts also made me think about my favorites from around here. 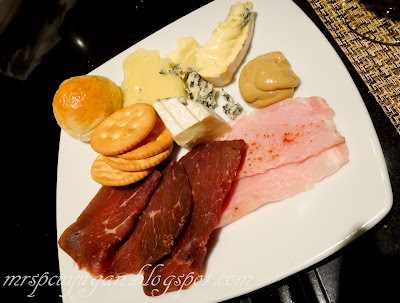 I am a self-proclaimed real housewife of Alabang, and so I figured that I should start writing about this amazing place in the south more often. I’ve tried living further up north before, and I have always came back. It has changed so much over the years, but it remains to be home to me. I’ve seen many old favorites come and go, and new stores and restaurants open up and become favorites too. There are places here that I never learned to love, and those that eventually grew on me. I still mourn the loss of Okasan and Dulcinea, which were both located in the Alabang Town Center of the 90’s. For this Sunday Seven, though, I don’t want to think about old favorites. This is my current list of favorite Alabang restaurants. I have always loved The Bellevue. It remains to be one of my favorite hotels in the south, even though it has literally been years since I was there last. Cafe d’Asie serves one of my favorite breakfast spreads. Their burgers are amazing too. I’m making myself hungry just thinking about their buffet. I think it’s time to schedule another visit! I recently wrote about the first time we tried Kessaku. It has quickly become one of our family’s favorite Japanese restaurants in Alabang. I had lunch here with my parents just last week, and the food quality was consistent with our first time. Their sushi and sashimi selections are superb. Must-try dishes are the Tori Kuwayaki and Angus Rice. I love Mexican food, and so I was extremely happy when Hermanos opened in Molito. The servings here are big, and definitely good for sharing. The best part about this place is that they close late, so it’s a great stopover for a late dinner or midnight snacks after a long day. I’ve already asked MrC to stop there for quesadillas after he picked me up from an evening event. I was tired and hungry, and the cheesy goodness really made my night. 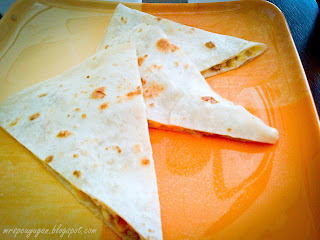 Quesadillas. Great any time of the day or night. This one’s a recent discovery. 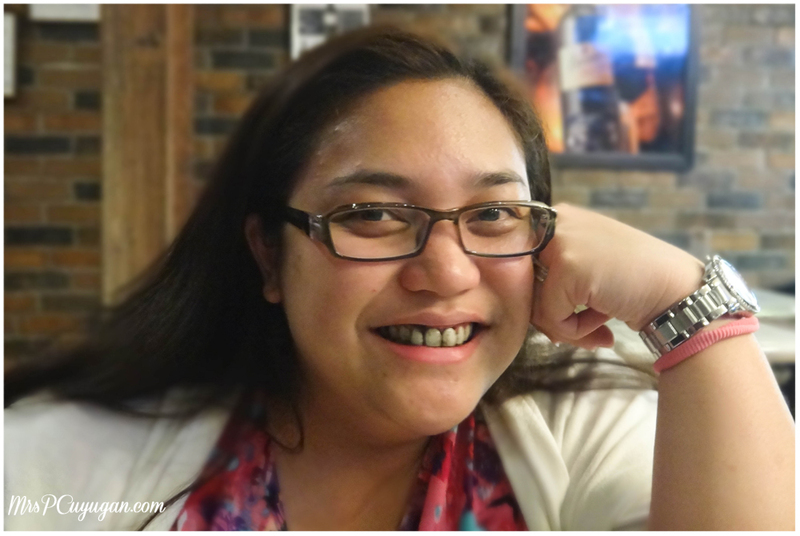 MrC and I had dinner at Barcino for Valentine’s day, and we really enjoyed it. If you love wine, this is a place that you will enjoy for sure. At the same time, if choosing wine intimidates you a little, you can always ask your server for a little help. We order red wine more often than white, and so we asked for a recommendation for what would go well with our gambas and paella negra. The wine that our server suggested was absolutely perfect, and we went home with huge, black smiles. 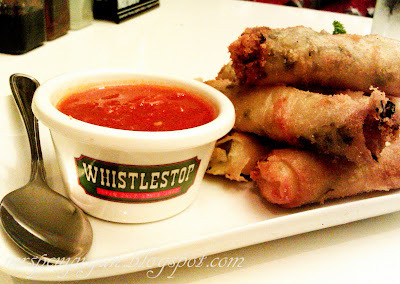 We would eat at Whistlestop a lot when I was still working for Filinvest. It was one of our favorite places to have dinner after a show or event at Westgate. It’s still one of those places we like to go to for comfort-food that we don’t have to prepare on our own. They have really fast WiFi too, and they’re open 24 hours. 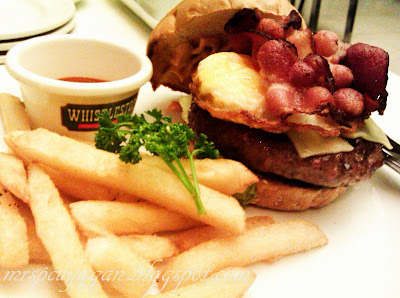 This one’s another great option for late night munchies, or for a nightcap involving a few bottles of San Miguel beer. Chili’s is on this list simply because the food there is unbelievably good. That is all. There’s always room for dessert at Chili’s! I was so happy when Cafe Breton opened in Westgate, after disappearing from Alabang for a while. This was a favorite hangout of my circle of friends from way back in our high school days. It still remains on top of our list of options for get-togethers now that we have our own families already. Bonus: The kids love it here, too! What are your favorite places to eat in your neighborhood? Do share, so I can remember to check them out if I’m ever in your side of the world. PS Check out my other Sunday Seven posts here. My Halloween celebration began last October 30 with back to back events at Festival Supermall and Westgate Center. At the end of that day I was simply exhausted and craving for comfort food. The boys and I decided to have dinner at Whistlestop, which opened its doors to Westgate customers just a few weeks ago. Whistlestop has actually been around since the 70’s. It closed shop sometime in 2005, and just recently reopened in Makati with a new look. Many hold this place close to their hearts like my mom who recalls good times spent at Whistlestop, which was one of the few restaurants open 24/7 back in the day. Meanwhile, I think I had only eaten there once before, and I can’t even remember if I enjoyed the food or not. The boys went into the restaurant a few minutes before I did, as we were still packing up after the Magical Halloween event. When I arrived they had already placed their orders – Nasi Goreng for Mr C and a Bacon Cheeseburger for the kiddo. They also ordered Mozzarella Sticks as an appetizer. After a quick scan of the menu, I decided on Boneless Buffalo Chicken Wings with Bleu Cheese Dressing. I was surprised that it took quite a while for our food to arrive since there was only one other family dining at the same time as we were. 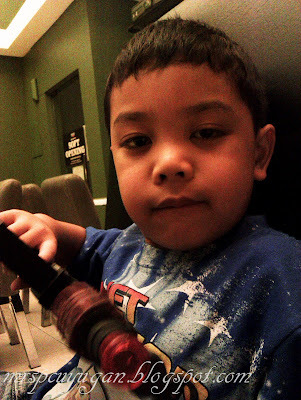 Luckily, the little guy got a prize at the event earlier and that kept him occupied while waiting. The mozzarella sticks arrived first, and they weren’t exactly what I was expecting. I didn’t read the description of the dish on the menu, so I was thinking they would be breaded and fried. Instead, we were served a stack of cheese spring rolls with what I think might have been cilantro (yes, I know I should have checked the menu). I really loved the marinara sauce that came with the dish. It was tangy and just a little bit spicy, absolutely perfect with the cheese sticks. 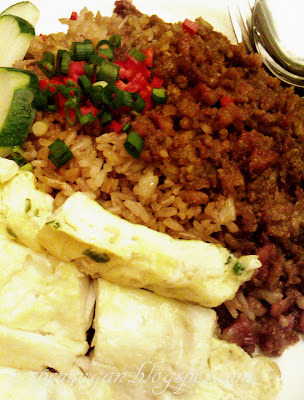 The little boy’s burger and Mr C’s Nasi Goreng followed a little after the appetizer. The servings were pretty big, definitely worth the price. I didn’t get to try the burger, but since Tristan was only able to finish half of it, I’m guessing it’s pretty heavy. We actually took home the uneaten half and had my brother eat it. He said it reminded him of a thicker, denser Tropical Hut Hamburger, which means it’s pretty good in a Pinoy burger kind of way. The hubs seemed to enjoy his Nasi Goreng judging from his clean plate at the end of our meal, and there was quite a lot of it at the start. I took a bite and found that it was pretty good but nothing extraordinary. My last encounter with Nasi Goreng was during our honeymoon staycation at Sofitel last September, and that is still by far the tastiest bagoong rice I have ever had. While waiting for my meal I decided to order a glass of Iced Tea with Mango Juice, which sounded weird at first but was actually really good and refreshing. Finally my food arrived, and it was a good thing that it was worth the wait. The chicken was tender and really tasty, and the serving was pretty big. 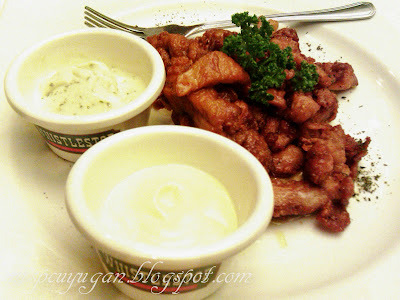 The bleu cheese dressing was a perfect match, though at PHP 50.00 it was a pretty pricey add-on. There was more than enough food for three people on our table, and as expected we had a lot leftover for takeout. 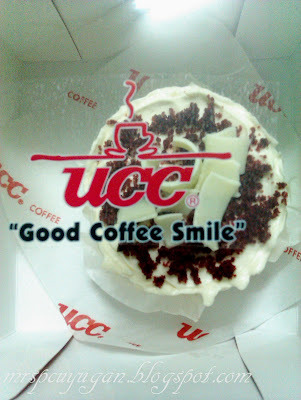 We were all full after such a big meal, but since there’s always room for dessert, I decided to stop by UCC before heading home to grab a piece of my favorite Red Velvet Cake to go. There were some other interesting items on the Whistlestop menu, and I am definitely looking forward to coming back to give them all a try.